Great to see you here! Right now, I’m sharing a little about the hero in Forever in a Kiss (Kissed by the Bay series, 7), which releases this April. 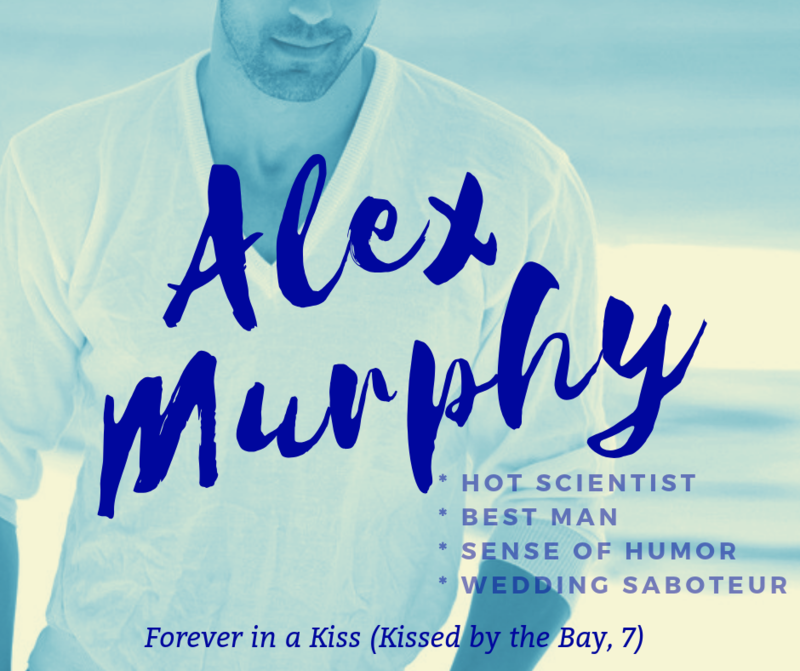 Alex Murphy is a hot scientist, who makes Claire laugh, even though he’s the best man at her client’s wedding and he’s doing everything in his power to stop the wedding from happening. Yikes! Wedding dress designer Claire Davenport never forgot about her first kiss with geeky Alex Murphy during a game of Spin the Bottle, so when Alex tries to stop her client’s wedding she’ll do whatever it takes to convince him true love is real. “You’re saying your interest in Missy’s wedding has nothing to do with helping your dress design business? You expect me to buy that, Claire?” Alex asked. “How dare you,” I said, wondering how he knew my motivations. He squinted, narrowing his gaze at me. I tried not to look away from him, since he might take that as a sign I wasn’t telling the whole truth. “No . . .” My confidence was waning under his unrelenting smirk and those eyes that seemed to peer straight into my soul. “That’s right,” I said, knowing I was lying. At this point, I even knew that he knew I was lying. But I wasn’t going to verbally confirm it to him. “I don’t believe you,” he said, the corner of his mouth curving upward in a knowing way that made me shiver. Then his mouth stretched into a smile as if he knew the physical effect he was having on me, while I stood there wishing I’d never kissed Alex during that game of Spin the Bottle. “I’ll see you later, Claire,” he said. I hope you enjoyed this little peek at the hero, Alex Murphy, from Forever in a Kiss, which is available for pre-order on Apple Books and Amazon. Happy reading!! Copyright © Susan Hatler, All Rights Reserved.